Catering Connection is a full service catering company with two divisions that proudly serves the personal, professional, and corporate market as well as the industrial and emergency response market. The Pace family has a long rich history in catering throughout the gulf south region over the past 20 years. Catering Connection operates through out the entire Gulf region and is the exclusive caterer for events on the grounds of the Myrtles Plantation. The Pace Family also operates the Carriage House Restaurant at the Myrtles Plantation managed by son, Kaine Pace, and Feliciana Seafood Market and Deli managed by son, Kody Pace, which keeps the whole family busy in the food and beverage business. Whether you are planning an elegant special event, corporate event, or family gathering, we have the equipment, staff, and experience to exceed all of your expectations. We are fully mobile and also have tents, tables, chairs and equipment available for rental too. You may choose to host your event at one of our facilities or at the venue of your choice either way we can help! We operate two fully equipped mobile kitchens, an 18’ wood fired coffin pit and a 20’ Southern Pride SP 750 Rotisserie pit. 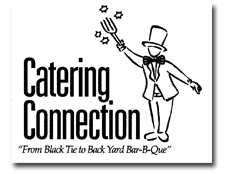 We take great pride in our motto “From Black Tie to Backyard BBQ”…......... We do it all!" During “boiling season” we operate 4 boiling rigs and pride ourselves in serving up some of the best crawfish, shrimp and crabs you've ever tasted! We can serve 20 to 2000 guests with a boiling capacity of over 10,000 lbs PER HOUR. We have served crawfish boils up to 12,000 lbs and cooked for over 900 guests at weddings and over 2000 people on emergency response teams. Our fish Fry's and Jambalaya are well received and different from most you've had! For us to state that we have “some” experience is quite an understatement! We truly appreciate the opportunity to share our passion for good food and fun events! Catering Connection offers a menu that is sure to please every palate and includes options to suit every budget. Fully licensed and insured (General Liability, Workers comp, Food Safe Certified, AR-C and liquor liability available) we have the capabilities to perform with an outstanding level of service as we offer you our superb menu choices. We look forward to serving you and being part of your next event soon!